Working on Thanksgiving Day is a sacrifice that millions of Americans make every year (another thing for the rest of us to be thankful for), but for a Forestville man, being away from home on that special day was made a bit easier by a $50,000 win. A quick Lottery purchase on the way to work and a quick look at the winning numbers online made Thanksgiving 2010 a memorable one. He called home with the news but still had a few hours on his shift. The time, he tells us, seemed to drag a bit as he looked forward to getting home to celebrate the holiday and the big win with his family. The $50,000 win, taxes-paid due to a special promotion which was drawing to a close, will help with school bills and making this Christmas extra special for his daughter. 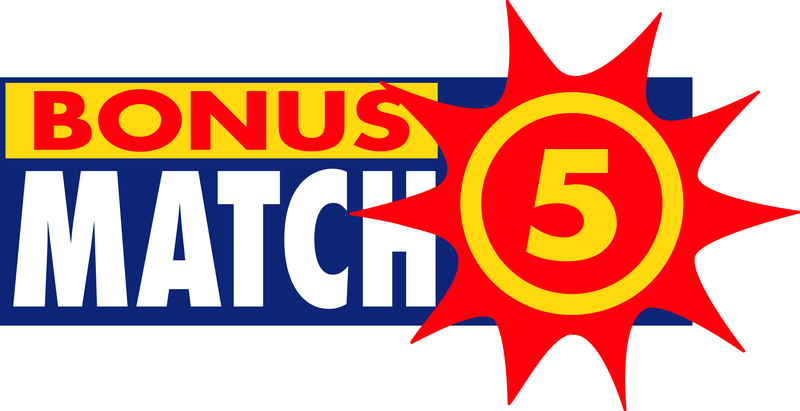 A $50,000 Bonus Match 5 prize is certainly something to get excited about. A $50,000 Bonus Match 5 prize with all state and federal states paid is something to get really excited about. That was the reaction of the 50-year-old Silver Spring man who arrived at Lottery headquarters to claim his taxes-paid prize. The happy winner who was accompanied by his girlfriend was overwhelmed by his newfound fortune. The “bonus” win was a result of the Lottery’s current Bonus Match 5 Doubler promotion which runs through November 21st. 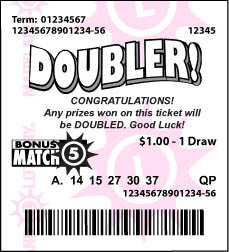 During the promotion, not only will Bonus Match 5 winnings be doubled if the word DOUBLER appears on the winning ticket, but the Lottery will also pay the estimated state and federal taxes on all of the top-tier $50,000 and $100,000 prizes. The store cashier plans to use his winnings to pay on his mortgage and car. He also intends to give some money to his family. The winning ticket was purchased at Barnabas Liquors located at 4620 St. Barnabas Rd. in Temple Hills. The Bonus Match 5 Doubler has been extended one week. 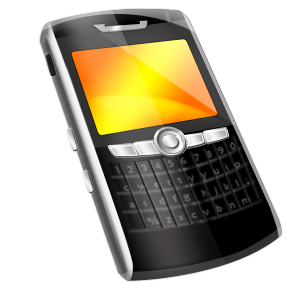 The promotion will now end on Sunday, November 28. Play Bonus Match 5 October 25 through November 21 for a chance to double your winnings up to $100,000 on every play of $1 or more. Just look for the DOUBLER! on your ticket. Also, TAXES ARE PAID on all top prizes of $50,000 and $100,000. Three Bonus Match 5 tickets, four birthdates and one anniversary date added up to a big win for a lucky Glen Burnie man. The 50-year-old arrived at Lottery Headquarters to claim his $150,000 prize – the result of three $50,000 winning Bonus Match 5 tickets. The grocery store employee was preparing to watch a football game, but before the gridiron action, he tuned in to the Lottery drawings on WBAL. As the Bonus Match 5 numbers were revealed, his wife became increasingly excited as he called out the numbers. At the end of the drawing, they anxiously ran to their computer to check their ticket and verify their win on mdlottery.com. “I checked the tickets about five times before I could believe what I saw,” said the winner. Once convinced of their new wealth, he and his wife cheered and celebrated. They then put the ticket in a safe place overnight. The man, who has one stepdaughter and two grandchildren, plans to use his winnings to pay off his car and help his mother and mother-in-law with costly bills. The winning ticket was purchased at High’s, located at 7602 Baltimore Annapolis Blvd in Glen Burnie. 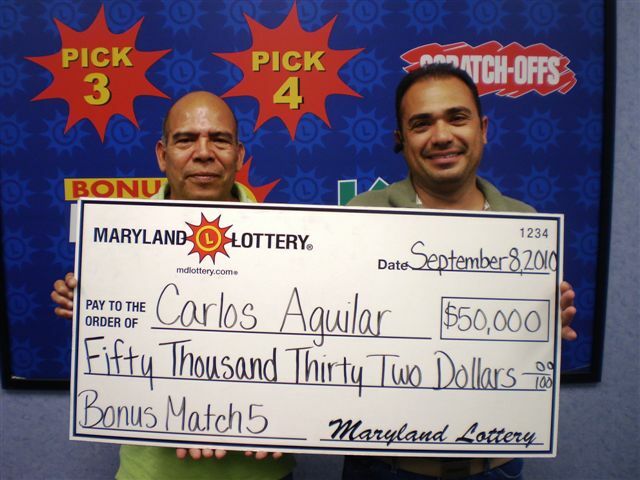 Carlos Aguilar was nearly 5,000 miles away when he discovered that he was $50,000 richer. His friend of 22 years, Orlando, purchased a Bonus Match 5 ticket for him while he was in Hawaii where he was taking one of his sons to college. Orlando bought the Bonus Match 5 ticket for Carlos the day he left town. Orlando also was the one to check the ticket and discover his friend’s good fortune. “I was so excited, I immediately called him in Hawaii,” said Orlando, who accompanied Carlos to claim his prize. “He called me at 10:30 PM our time, which is 5:30 AM in Hawaii,” said the 40-year-old winner. “I was asleep. When he told me I’d won the Lottery, I sure was surprised. If it was somebody else he would have cashed it,” added Carlos with a chuckle. Aguilar’s faithful friend Orlando kept the winning ticket in his wallet until Carlos returned home this past Wednesday. “I would have been here Tuesday, but I missed my flight. I’m still tired. I’m still trying to get use to the time difference,” Carlos confessed. However, Carlos doesn’t have a problem getting use to being $50,000 richer and having a real friend he can count on. The Montgomery County resident said this is the first time he has won anything. When asked what his plans were for his newfound riches, the father-of-two-college students said that he intends to pay for school for both his sons and, of course, give something to Orlando. The winning ticket was purchased at the Silver News at 8661 Colesville Rd in Silver Spring. “One time I hit Bingo, so I created a trail of money from my car, up the path and into the house,” said a lucky Lottery player from Ocean City. “That’s how I told my husband I won.” The creative flair for announcing news is something the twosome has in common. This time around, it was the husband’s turn to cleverly communicate their $50,000 Bonus Match 5 win.. The retired couple bought the Bonus Match 5 ticket prior to taking a five-day cruise. Upon their return, they had no idea they had won. Even after seeing signs in the store where they had purchased the ticket saying that it had sold a winner, they didn’t suspect it was them. It was almost three weeks later that the 73-year-old wife threw all of her Lottery tickets on the bed and headed out to play Bingo. That’s when her husband decided to check them. To his surprise one of the tickets was a $50,000 Bonus Match 5 winner. The happy pair said that they will use the prize money to pay down their mortgage and paint their house. The winning ticket was purchased at Ocean Market, located at 14107 Coastal Hwy. in Ocean City. A Howard County woman received a huge bonus while playing the Maryland Lottery. As usual, the 51-year-old played her daily numbers. But, this day turned out different when she matched all five of her Bonus Match 5 numbers, bringing home the $50,000 top prize. With her winnings, the mother-of-two plans to get her daughter a car, pay for college and pay taxes. She and her husband have owned their own business since the 1970’s. The winning ticket was purchased at Box N Save, located at 3409 Dundalk Avenue in Baltimore.